This article will cover each of Destiny’s Exotic Warlock helmets. Private Reserves – Immediately regenerate health on activating your Super. Similar to Light Beyond Nemesis, the Apotheosis Veil is equipped with Infusion which regenerates your heath when picking up orbs. Uniquely, this helmet is equipped with the Private Reserves perk that triggers health regeneration when Super abilities are activated. Private Reserves is one of those perks that can potentially save your life and turn around and engagement, equally useful in PvP and PvE, but is a perk that will only benefit you in a few situations. This is another piece of gear that strongly encourages a grenade lobbing playstyle. Any melee damage causes a boost in the recharge of your grenades; you don’t even have to land a kill to get more energy. While Fireborn Sunsingers won’t find much use in the Apotheosis Veil, a Voidwalker or Radiant Skin Sunsinger’s can make interesting changes to their playstyle with it. If you’re low on health, you can pop your Nova Bomb to obliterate anything nearby and let your health regenerate.As a Sunsinger, you can activate your Radiant Skin and regain your health before you even enter a fight. Private Reserves is a niche perk, but it can be worked into pretty much any playstyle with ease. In Crota’s End hard mode, this perk plus Infusion will allow you to easily regenerate health and is perfect for the Crota encounter. Apotheosis Veil will give you Discipline, decreasing the grenade cooldown, which goes well with the Serpent’s Tail talent. Private Reserves is situational, but the helm makes up for it with Serpent’s Tail, because you’re always able to melee so that you can use your grenades more and more. The cosmetic appearance of this helm is sleek and clean, and it stands out very well. This is an OK helm to have as any Warlock, as it’s subclass-neutral, but we can’t recommend it because Infusion and Private Reserves are too niche. For a team player who wants medic-like perks, this helm is worth picking up. This is an ideal helm for 3v3 Crucible, since you will be resurrecting teammates faster. Light Beyond Nemesis is another subclass-neutral helm. It shares the Keeper of the Pack perk with Crest of Alpha Lupi, allowing you to really support your teammates. This helm will obviously be most useful in situations where teammates can be revived. The Keeper of the Pack won’t affect the countdown timer in raids, but it does help when physically standing over someone and holding the revive button. This helm will give you Strength, which goes well with the increase to melee attack speed. Snap discharge is great to have, allowing you to come out on top in a melee fight, and is the one perk that saves this helm from getting a lower score. Ultimately this is a decent helm for personal support, but with Infusion and Keeper of the Pack, the perks just are too niche to qualify this helm for general use. It’s worth keeping though if you know you’ll be in a situation where either of those perks will come in handy. Of course Infusion will be most beneficial when fighting Crota on hard mode. Even though Light Beyond Nemesis is subclass-neutral, it’s really outclassed by every other helm, and should be replaced if possible. 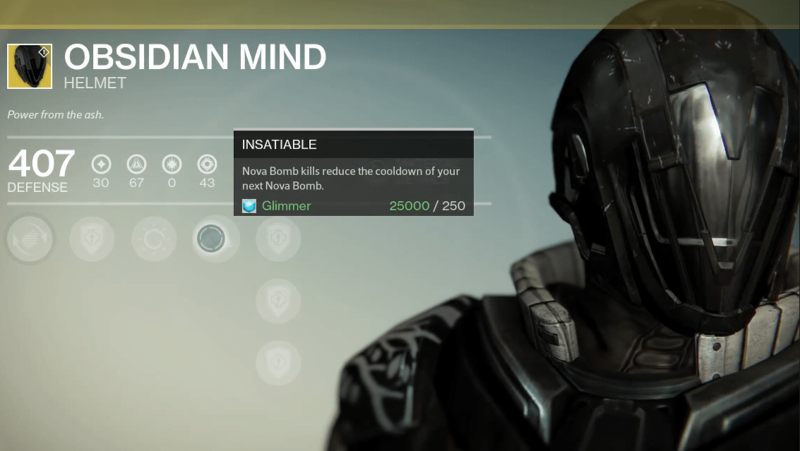 Obsidian Mind, introduced with The Dark Below, will be most beneficial in PvE. Obsidian Mind will give you Intellect and Strength. The real benefit comes from the Intellect, since it will help with your Super recharge. Finally, the increased grenade throw distance… this perk feels out of place on this helm, but is a nice quality of life addition if your gloves don’t happen to have it. This is definitely one of the best Exotic pieces for the Warlock, even though it looks bland, it’s absolutely worth using. Skull of Dire Ahamkara‘s main perk will make you harder to kill while throwing your Nova Bomb (niche/unattractive), and will improve your Energy Drain. This helm is designed for the Voidwalker who wants to use the Soul Rip/Embrace the Void talents. It entirely revolves around giving you a large up-time up the Energy Drain buff, which will give you more grenades (leading to more kills). If you’d like to use your grenades and Super a lot, the Skull of Dire Ahamkara will allow you to throw grenades further, which hopefully results in more kills. Energy Projection definitely isn’t the most useful perk to have though, and may never even help you. The increased effectiveness of your Energy Drain ability (“siphon”) is wonderful, as it’ll allow you to have more grenades at your disposal. More grenade kills means more Super kills. If you like using your Nova Bomb and grenade, this is a suitable helmet. Not to mention, it looks awesome and intimidating.